Delicious fish tacos in under 30 minutes. Taco night just got more awesome! Today, we have a new taco recipe to share with you. Sweet Kale Fish Tacos are loaded with nutritious veggies. And from start to finish they take just 30 minutes to make! From a mom’s perspective, they’re already a win. Your family will dig them because they’re so darn good! These tacos have a secret ingredient that makes them fast and full of flavor. Sweet Kale Vegetable Salad Kit from our brand partner Eat Smart. Yes, a salad kit! This particular salad kit includes 7 superfoods: kale, green cabbage, broccoli, Brussels sprouts, chicory, roasted pumpkin seeds, and dried cranberries. We save the pumpkin seeds and dried cranberries for a different use, but everything else gets added to the tacos. We mix the dressing packet included in the kit with a bit of lemon juice, garlic, and adobo sauce to create a sauce that is bursting with flavor. In a small bowl, whisk olive oil, balsamic vinegar, garlic salt, 2 tsp of lemon juice, and lemon pepper. Add fish to marinade, flipping to coat. Place fish in a baking dish, and pour remaining marinade over fish. Bake for 10-15 minutes or until internal temperature reaches 145 degrees Fahrenheit. Make dressing - whisk together dressing packet, adobo sauce, 1 1/2 tsp lemon juice, and garlic. Add salt and pepper to taste. In large bowl, add the Sweet Kale Salad vegetable blend (set aside cranberries and pumpkin seeds for another use). Toss salad with dressing. In a small skillet, warm tortillas one at a time in a dry pan. Place half of each fish fillet onto each tortilla, top with salad blend, avocado, cilantro, and sour cream. 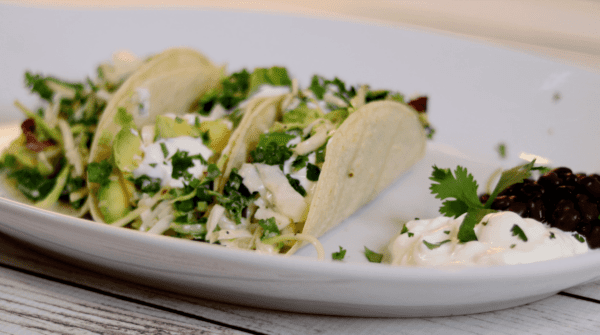 Add Sweet Kale Fish Tacos to your taco night rotation and then let us know how your family enjoys this recipe. If they’re anything like ours, they’ll be begging for more next week! Do you have a taco secret ingredient? Look for Eat Smart’s Sweet Kale Vegetable Salad Kit in the produce department of your grocery store. If you can’t find it, put in a request with the produce manager. They’re always eager to hear from shoppers!